In this album I reconnected with my roots in Christian spiritual music. I always loved the amazing mystic power in the old chorals and admired the old masters how they could connect us with higher realms . So I tapped this source and as a result I composed very quiet classical music. Like always I combined my own western style with the richness of oriental music to create a unique blend of musical cultures and styles. This music expresses my spiritual journey and the experience of divinity and oneness in a very deep and personal way. It is also made to help you raise your frequency through the sacred mantras. Listening to this music you can dive deep into your inner world and touch the home of your soul. From time immemorial we have the distinction between secular and sacred music, in the German language the latter is also referred to as „spiritual“ music, which means music for churches and liturgies. Whoever thinks that this is really a narrow track should be reminded that great masters of classical music such as Bach, Mozart or Bruckner were never too happy to compose Masses and other liturgical works for church use. After all, the orientation is clear in this music: it is about the glorification of God and an opening of man for the higher dimension. Is this a good introduction for Felix Maria Woschek? I would say that the CDs of the mystical musician living in Portugal may be found in shops under the genre of „world“ and „meditation“, but with „Soul Journey“ (Silenzio), his new production, these categories have definitely become too narrow. What’s more, half of these four long pieces come from the canon of Western Church- music. But more about this later. First, I will try to describe the almost half-hour title track. It develops from a leisurely intro with tambura and overtone singing that creates a breadth that is beyond anything else. A flute sets in, flattering a melody that gradually emerges. The OM changes into a heart-mantra that the musician derived from an old Bulgarian song. With a drummed rhythm, the singer finally leads over to the ancient Hebrew Y-H-W-H, the Kabbalistic code to the unfathomable name of God. On top of that. It is followed by an Ave Maria, full of strings and brass in minor. I must confess that I skipped this piece and the subsequent Kyrie Eleyson in the beginning. 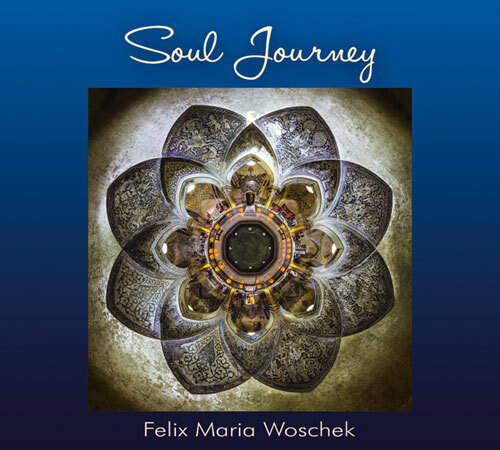 My goodness, now I sing along with it, melt and indulge in the feminine heart-quality that Felix Maria Woschek honors and praises with a pure heart and beyond all religious confessions. For his new production, the well-traveled musician, who appears in various constellations at peace-festivals around the world, has retired to his own studio in his chosen home country. Challenged by the plight of the world, he had to reflect on what he knows best and has to offer to the world by composing and singing. Surely. Soul Journey is balm on the festering wounds of our time. Felix Maria Woschek conjures simply heart music for the world.